I would like to take this opportunity to introduce myself. I am the General Secretary of the Chittagong Hill Tracts Jumma Refugees? Welfare Association, current member of the Task Force on Rehabilitation of Returnee Jumma Refugees and Internally Jumma Displaced Persons, and member of Parbatya Buddha Mission. Please accept my best wishes and honor on behalf of my organizations and myself. I thank gratefully the honorable members of the INEB for inviting me and support to participate in this 21st Annual Conference of INEB. 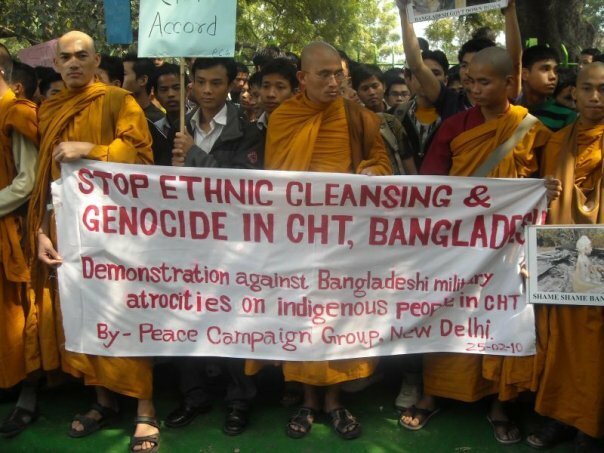 Future of the Buddhist people in the Chittagong Hill Tracts (CHT) is highly alarming. The Parliament of Bangladesh passed the Constitution Amendment Bill on 30 July 2011. With that amendment, ?Islam? has been declared to be ?State Religion? in Bangladesh. With the amendment, ignoring separate and distinct identities of indigenous peoples of the country, identity of ?Bengali? has been imposed on all indigenous communities. Indigenous people of the whole country demand constitutional recognition, including guarantee of land rights. The indigenous people of Bangladesh have strongly protested and rejected controversial provision of the 15th amendment of the constitution of the country, and government?s policy of non-recognition of the indigenous people of the country. As you all are aware that a 20-point package facilities agreement was signed between Jumma Refugees? Welfare Association and the government of Bangladesh in Agartala of Indian State of Tripura on 9 March 1997. On the other hand, the Chittagong Hill Tracts Accord (CHT Accord) was signed between the government of Bangladesh and PCJSS on 2 December in 1997 with an aim to resolve CHT problem through peaceful and political means. Investing full trust and confidence in the government of Bangladesh 64,611 people of 12,223 families of Jumma refugees, repatriated to Bangladesh from Indian State of Tripura. The returnee Jumma refugees and internally displaced Jumma people could not be rehabilitated due to non-implementation of the main issues of the CHT Accord and the 20-point package facilities agreement. Security of their lives and properties has not been ensured. Still 40 ancestral villages of returnee refugees are under the occupation of the Bengali settlers and 9,780 Jumma families are yet to get back their lands. Many of repatriated Jumma refugees have not got back their government jobs and those who have been able to get back their jobs their seniority have not been honored and outstanding government loans have not been wiped out. Rehabilitation of returnee refugees has not been possible till today because of occupation of their land and villages by Bengali settlers. Most of the provisions of the Accord, especially the main issues like introduction of special governance system in CHT with effective enforcement of the three HDC Acts and CHTRC Act, preserving the characteristics of tribal-inhabited region and attaining the overall development thereof, resolution of land disputes through the Land Commission, rehabilitation of returnee Jumma refugees and internally displaced Jumma families, withdrawal of temporary camps of security forces and de facto military rule, preparing voter lists only with the permanent residents of CHT and etc. have been either left unimplemented or only partially implemented. Though almost three years of tenure of present Grand Alliance Government led by Awami League has already passed, but there is no sign to fulfill its pre-election declaration to implement the CHT Accord at all. Rather there occurred a series of incidents throughout CHT since the assuming of power of the present Awami League-led Grand Alliance government. Hundreds acres of land of Jumma people has been grabbed by Bengali settlers during post CHT-Accord period. Thirteen communal attacks have been inflicted on the Jumma people by the Bengali settlers, in most cases in collusion with security forces. Communal attack on indigenous Jumma villagers at Ramgarh and Manikchari upazila (17 April 2011) in Khagrachari district and Longadu upazila (17 February 2011) in Rangamati district were the latest violations committed by Bengalis settlers in collusion with the security forces. The military continues to remain the supreme authority in the region, as they did during pre-Accord period. Infliction of gross human rights violations on the indigenous peoples continue. The violations include arbitrary arrests, torture, extrajudicial killings, harassment of rights activists and sexual harassment. In most cases the violations happen with impunity. While the Government publicly supported freedom of religion, attacks on religious and ethnic minorities continued to be a problem during the reporting period. There were reports of discrimination based on religious belief or practice in the CHT during the post-accord period. At least 6 Buddhist temples and an orphanage are in illegal occupation of Bengali settlers. Mohamuni Buddhist Temple in Mahalchari and 10 acres of land of Mahalchari Buddha Shishughar (a Buddhist orphanage) has been grabbed by Bengali settlers. Jumma Buddhist monks, including Ven. Sadhanananda Mahashtabir, Banabhante, Ven. Nandapal Mahasthabir, Ven. Uchahla Mahasthabir, and Ven. Sumana Lankar Mahasthabir, have been striving to protect, promote, and preach Buddhism. However, as there have been no special measures of the government, the land of the Buddhist temples and orphanages has not been given back to the owners of the land. The Army officers impede Buddhist monks, novices, and devotees in practicing their religious activities. If international pressure is not imposed on the government of Bangladesh, existence of Jumma Buddhist people will be endangered. Let me make a strong appeal to all of you to support us regarding rapid and full implementation of the CHT Accord, rehabilitation of the Jumma returnee refugees and internally displaced Jumma people, restitution of land rights of the Jumma people, including getting back land of Buddhist temples and orphanages, that has been grabbed by Bengali settlers, security forces, and other outsiders.
? To encourage the Government of Bangladesh, for rapid, full and proper implementation of the CHT Accord. Thanking you all for patient hearing. 2. 19 and 20 February 2010, (1) Gyanangkur Buddha Vihar (2) Moitripur Banani Bana Buddha Vihar. Bagai hut, Bagai Chari, Rangamati.